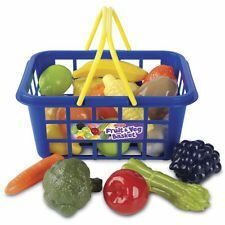 Fruit and Vegetable Basket specially designed to provide hours of stimulation and fun! Ideal for developing imagination and social skills. Realistic food packaging and basket for visual stimulation. Play encourages the development of hand-eye coordination.